Our contributors are very talented people, many of whom have a hand in different projects that support their communities and the world around them. 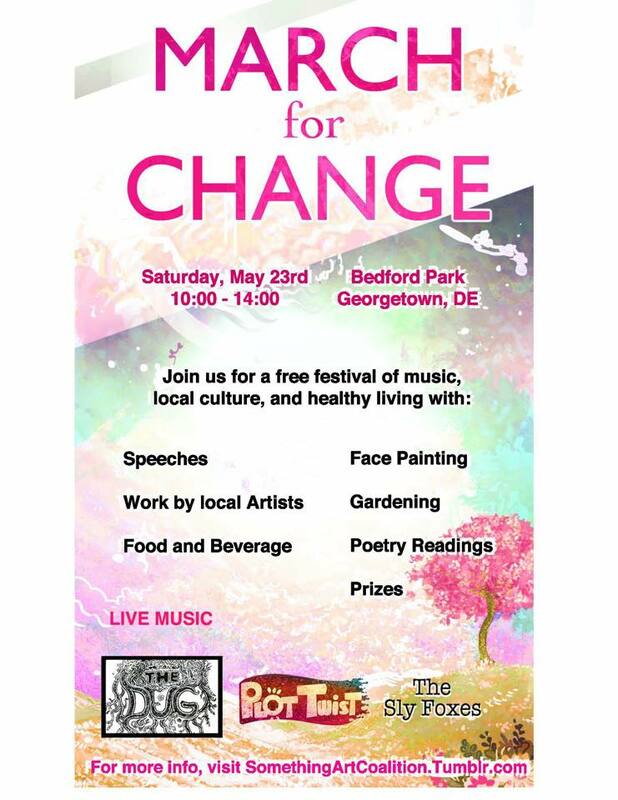 David Luna is responsible for the Something Art Coalition and has done a lot to help the upcoming March For Change event in Georgetown, DE. You can read about it below! On April 25th the people of Nepal suffered a devastating earthquake. Thousands of people have died, and millions have lost there homes, and even entire towns have been destroyed. March for Change will be presented in part by The Shauna Rose Kaufman Foundation (SRKF), a charitable non-profit organization that works to spread art, education, and equality wherever we can serve. Before the earthquake, the communities in Nepal were already some of the poorest in the world, so in 2011 the SRKF partnered with Nepali activist Ram Krishna Sahi to provide an art teacher for an elementary school in Bhaktapur, Nepal. The teacher instructed 14 classes a week, serving over 500 students from grades 3-8. The foundation also set up a local art competition for the local schools, and established a sister school/art exchange program with Lord Baltimore Elementary. Currently, the foundation has three board members working in Nepal providing food, water, and medicine to affected communities. We have also been interviewed by local news sources, such as WMDT, WBOC, and the News Journal, about the crisis and our efforts. The SRKF and members of its open branch Something Art Coalition will continue to work towards things that benefit both our local communities and humanity alike. We want to bring lively and healthy local events for people of all ages to enjoy, we want to spread art and fulfillment, and we want to bring help to those in need. When we openly share our art, our music, and our ideas, we bring a richer spirit and vibrance to our world. And when we unite as a community to provide support for those in need, our global presence becomes stronger. Let’s do good for the sake of good. March for Change is a free event open to all, so please invite anyone and everyone you know. Previous PostTLH – Justifying Mother’s Day GiftsNext PostIssue #12 Now Available!